Connecting with your customers using conversational AI can be a game-changer for your bank. Customer satisfaction scores will skyrocket, brand loyalty will increase, and people will take control of their money and empower themselves financially like never before. So where are all the success stories? You’d be surprised how often banks get it wrong. Not because of the technology, but because their expectations are unrealistic and often the reason they fail. 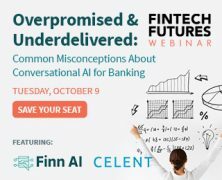 Hear Dan Latimore, Senior VP at Celent and Ben Terrill, VP of Customer Success at Finn AI, discuss the truth behind conversational AI for banking. These experts examine the most common misconceptions that could tank your bot deployment. Avoid these pitfalls and write your own AI success story. Be involved in the AI conversation and access the on-demand webinar now. Finn AI looking to help its clients modernise their authentication infrastructures. Featuring BB&T Corporation, Solgari and Tinkoff Bank. SkipFlag uses deep learning to help enterprises make sense of data they collect each day. SimpleMoney's co-founder explains the problem he’s out to solve and why he isn’t in the robo-advisory game. German AI savings technology firm looks to raise capital - both crypto and conventional. It's like cloud provider kindergarten! Everybody's special!